I’ve been pretty excited ever since Nokia announced it’s soon-to-be-released Nokia N97 all the way back in December. However, it wasn’t till earlier this week that I was actually able to get my hands-on the company’s new flagship device courtesy of Nokia Design Day, an all day press event held at Nokia’s design offices in London. 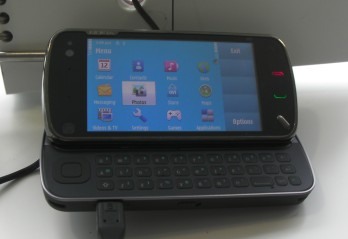 I got to spend about ten minutes playing with the N97 and overall I was very pleased with the device, both hardware build and looks, along with the newly revamped touch UI based on Symbian S60 5th edition. Overall, Nokia appears to have provided exactly what I and many users have been calling for: a phone with the Nseries media production and playback features combined with an Eseries-style QWERTY keyboard and build quality. The slide out QWERTY keyboard is a joy to use, with the keys protruding enough to give ample tactile feedback with each key press, and enough space between keys to rule out too many typos. Possibly as good as the E71’s fantastic keyboard, and certainly better than the slide-out found on the recently released E75. Another win for Nokia is the way the screen tilts at a 35 degree angle when the physical keyboard is on show, which proved to be the perfect viewing angle. On the software side, the most notable improvement is the active homescreen with its array of customizable widgets that pull in the latest content from various web services (Facebook, weather, email etc.) and other (local) data from apps installed on the phone. On that note, the Facebook app itself is impressive, certainly on-par with the iPhone’s. One area where I still think Nokia may have made a mistake, however, is in the choice to use a resistive rather than a more finger-friendly capacitive screen. They explained the decision based on the need to support handwriting recognition via a stylus for certain markets. If that’s the case, I’m not sure why they can’t offer two different versions. Having said that, the resistive screen is one of the most responsive of its kind that I’ve used, and the operating system’s overall responsiveness has definitely improved compared to earlier video demos that I’d seen. One other observation: The N97 looks a lot smaller in real life (in a good way) than in the many pictures that have been published. This thing isn’t bulky considering what’s packed in. Oh and if I end up purchasing the device, I’ll certainly choose the white/silver version, which looks a lot more stylish than the one in black (pictured above). Is it my network connection or is this video extremely choppy? Plays back fine for me. Must be your connection or YouTube's servers? It was choppy for me too, but I think its my wifi connection. Great hands on Steve, really looking forward to getting my N97, which is pre.orderd. Glad to hear the device is actually smaller than many of the images of it on the web show it to be.